Offering insights into the effects of the current political climate on Canadian Civil Society and to provide actionable solutions to harness public mobilization. Please note: This webinar will be run in English, with simultaneous interpretation in French. Michael Simpson: Executive Director, British Columbia Council for International Cooperation (BCCIC). Louise Simbandumwe: Co-Director, SEED (Supporting Employment & Economic Development) Winnipeg – a community economic development organization established to combat poverty. In the era of Globalization, increased trade and connections, the world is suddenly contracting. Rising nationalism has left many struggling to hold on to the vestiges of a progressive agenda in the wake of Brexit and the 2016 US election. At the same time, the world is faced with an intensifying refugee and migrant crisis, the threat of climate change and rhetoric undermining civil and human rights. This combination of challenges has led to a sense of confusion and hopelessness about how to respond. Are we facing a new global system? What impact will this shift have on Canadian Civil Society? Within Canada, the picture is potentially more hopeful. The Trudeau government has committed to a “feminist lens,” the Sustainable Development Goals and a multilateral approach. There has been significant citizen mobilization in response to a variety of issues, including support for refugees and women’s rights. However, without a clear direction and goal, there is a danger of Canadian activism and engagement fizzling out. So, how to reconnect with a sense of hopefulness? What can we, as Canadian Civil Society, do to unify and reorient towards the realization of a progressive agenda and fostering global cooperation? 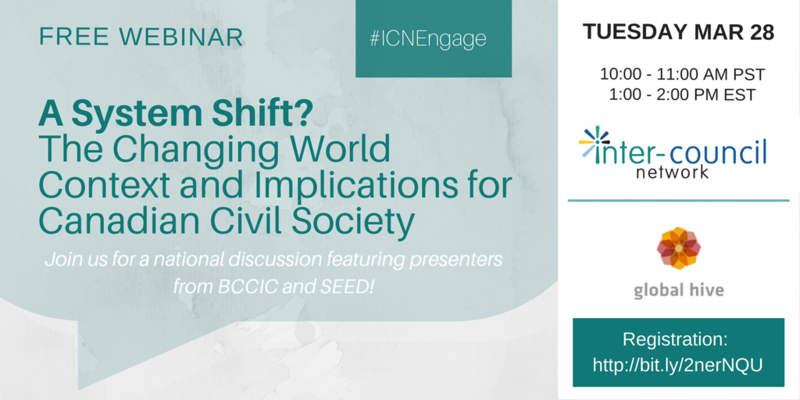 The #ICNEngage Webinar Series provides timely, bilingual, on-line learning opportunities for international cooperation and community development organizations across Canada. Organized by the Inter-Council Network, a coalition of eight provincial and regional councils for international cooperation, of which SCIC is an active member.